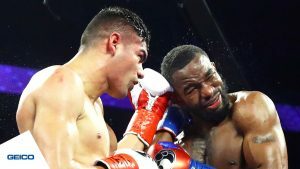 Everton Lopez (2-0, 1 KOs) kicked off Thursday’s Golden Boy Live broadcast from The Belasco Theater in downtown Los Angeles by polishing off Robert Seyam (2-3, 2 KOs) in the first round. A nice little left to the gut put Seyam down and out in a bout that ended almost as fast as it started. Next up was Yamaguchi Falcao (5-0, 2 KOs) battled Deartie “Vicious” Tucker (2-1, 2 KOs) in a six round super middleweight scrap. Falcao ripped into his man during the opening round and it looked like fans were in for the second rapid fight in a row. That proved not to be the case, however, as Tucker proved himself to be a game foe. Sure, Falcao landed the better, cleaner punches on his way to a unanimous decision win, but Tucker had shown up to fight and helped make it an entertaining scrap. The kid had a chin and an ability to scrap. Sometimes that’s all that’s needed for a fun bout. The third televised fight was a featherweight throwdown between two guys named Gonzalez. Joet Gonzalez (9-0, 4 KOs) was eager to improve on his undefeated record by taking on Mexico’s Ali Gonzalez (6-6-1, 1 KOs). The first two rounds proved to be fast paced and exciting. Ali went down with a shot to the gut in the second and, like Seyam two fights earlier, stayed there. Gonzalez (the one whose first name is Joet) may be someone to watch out for. One thing was certain, it was shaping up to be an exciting televised card. The main event featured undefeated featherweight Julian Ramirez (14-0, 8 KOs) against journeyman Raul “Bule” Hidalgo (23-13, 17 KOs) in a ten rounder. This was clearly meant to be a showcase fight for the baby-faced Ramirez (heck, his trunks showcased Corona, as well as the flags of America and Mexico), yet the first 90 seconds proved to be a cautious affair. Things heated up in the second half of the first, though, as Ramirez started letting his heavy hands go against his opponent. Hidalgo may not have been without skill, but Ramirez just proved to be the stronger puncher. The following four rounds were pretty much a replay of the first. Ramirez hit hard and Hidalgo kept standing. It was an active fight, to be sure, but not an exciting one. Still, Ramirez worked well and dominated. Hidalgo was game, too, which at least kept things interesting, if not thrilling. Truth be told, however, Hidalgo would have taken things up a notch if he had been a bit more aggressive. He was expected to try to win rather than survive, after all. Sure, he landed some clean shots, but the man never launched a full-fledged attack, which ironically might have spared him the beating he ended up receiving over ten long rounds. Ramirez ended up with a hard earned, unanimous decision win, of course. It was a fight where it was hard to look good. When a naturally strong man makes it his goal to simply not get knocked out, things can be tough for his opponent. Regardless, a win is a win and Ramirez certainly didn’t look bad.